Studio217 is a small independent game studio founded by two friends in Baltimore, Maryland. Cole and Karen met while studying at the Maryland Institute College of Art (MICA), in Baltimore. They were in the same year and major, Interactive Arts. They worked together for multiple projects as their education progressed, and discovered they worked quite well together. They decided to work together for their Senior Thesis project. This project turned into Mister Mart, the game they are most well known for, and has received the most recognition. They showed the game at the Commencement Exhibition for MICA, and spent the next year or two working on the game, getting it ready for the world. 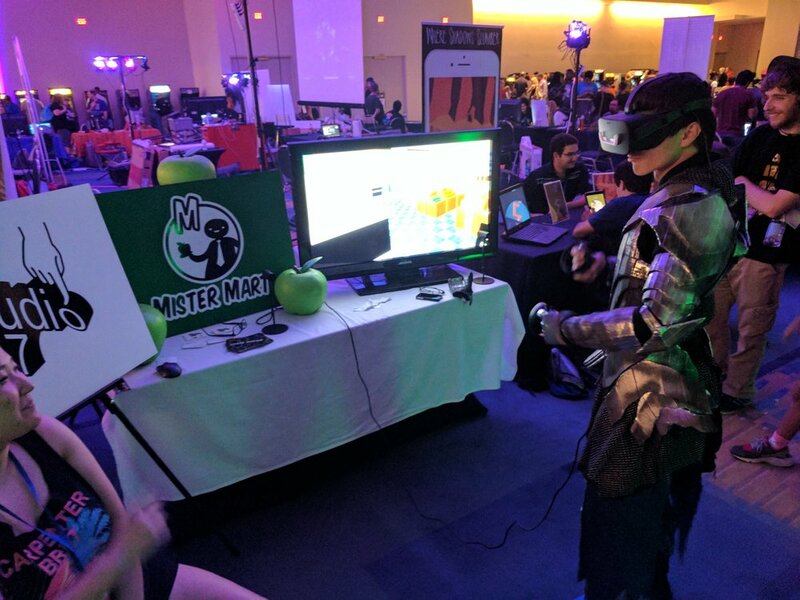 Mister Mart has been developed for the oculus rift since the very first iteration of the rift, the DK1 or Development Kit One. It has had to change and evelove to suit the fast-changing technology, and has seen many subtle iterations and changes to its gameplay. Mister Mart has been shown at many different venues and conventions during it's development. Its show at Artscape in Baltimroe, its shown at MAGFEST Music and Gaming Festival in Washington DC, and its shown at Awesomecon, also in DC. Mister Mart was released on Steam Early Access early 2017, and has seen multiple updates, with a full release date set for Spring of 2018. Though starting development after Mister Mart was first created, Circle Soiree saw an earlier release. Circle Soiree was first thought of at the last minute for a school assignment. The simple and unique idea of a multiplayer physical tablet game was too good to let die, and thus the studio worked on it, changing it and making it more refined and professional, until its release in 2017, on iOS and Android tablets. Studio217 is still going strong, with its first ever visit to PAX East in Spring of 2018. Mister Mart will release soon, and the studio has already begun work on a new multiplayer VR title, which they will be showing and testing at upcoming conventions and events.